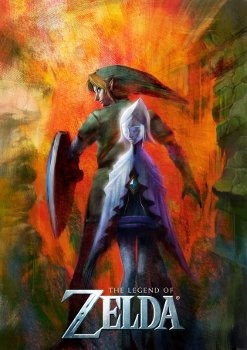 New Zelda Built From Twilight Princess? According to Nintendo, Twilight Princess didn't accomplish everything that it intended on the Wii and the new Zelda title might use the same engine. We think. The information stream about the as-yet-untitled new Zelda game has slowed to a near trickle. Shigeru Miyamoto did announce it at E3 this year with a piece of art, and Nintendo later said that the enhanced swordplay in the game would use the Wii Motion Plus addon. That's pretty much it, until director Eiji Aonuma spoke to IGN yesterday and said some words about how the game was using Twilight Princess as a backbone, much like Majora's Mask did with Ocarina of Time. At least, it could be interpreted that way. Here is what Aonuma said, "With Twilight Princess, we challenged ourself to create the most vast and realistic world the series had ever seen, but we don't feel that we were able to fully complete this objective. With that as a starting point for our improvements to the series in the future, we are of course working on a new game for Wii." He went on to not really clarify anything by stating, "For any game to be remembered for a long time, just like Ocarina of Time was, the game must give the strong impression that it has set a new starting point for future sequels to build upon. We are working to further improve upon the experiences found in Twilight Princess so that our future games can realize these innovations." I'm not sure if it's a language barrier or an inaccurate translation but it doesn't feel like Aonuma actually told us anything new. We know that Twilight Princess began development as a Gamecube title, so it is odd that they would reuse code from past generations. Still, the technology of the Wii isn't so advanced that it doesn't make sense for Nintendo to waste time redesigning from the ground up when the framework for a Zelda game already exists on the platform. Then again, if that's the case, what the hell is taking them so long to make it? Hell, we don't even have a title, let alone a release date. It's been 3 years since the last game and six months since it was announced at E3 and all we have is one lousy concept art shot and this non-news? Come on, Nintendo, throw us a fricking bone here.